For underrepresented groups in academia there is often a struggle of voice, invisibility, tokenism and isolation; therefore, how do women of color create a sisterhood in academia? This book integrates research with personal narratives and content of two students (Sophoria and Alexis) as they complete the dissertation writing process. The book further provides a culturally responsive design for graduate students, educators, mentors, administrators and researchers. 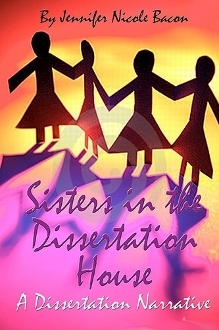 Sisters in the Dissertation House: A Dissertation Narrative chronicles the journey of Sophoria and Alexis, over a period of two years, as they participate in the PROMISE dissertation program for underrepresented graduate students at the University of Maryland and face the day-to-day challenges and triumphs of completing their doctorates. Jennifer Nicole Bacon is Assistant Professor of Special Education in the Department of Education at Iona College. As a special educator further trained in yoga and the use of poetry therapy, Dr. Bacon incorporates a holistic approach to instruction. Committed to addressing issues of overrepresentation in special education, gender equity and writing for social change, she volunteers, presents and publishes for numerous organizations in the United States, Africa, Latin America, and Europe.